Silly rabbit. What’s with those teeth? They’re Tic-Tac mints! Have fun making these easy bunnies for Easter. How to Make It: Frost cupcake. Cut marshmallow in half widthwise and sprinkle each half with pink sugar and place on cupcake for ears. If you’d like and have the gear, pipe (squeeze while holding tip in same place, stop squeezing and pull away) white icing in two mounds for bunny cheeks. Add chocolate chip eyes, jelly bean nose and Tic Tac teeth. 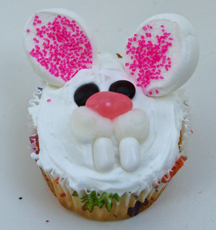 This entry was posted on Sunday, March 2nd, 2008 at 4:00 am	and is filed under animal cupcakes, Easter cupcakes. You can follow any responses to this entry through the RSS 2.0 feed. Responses are currently closed, but you can trackback from your own site.